Drosophila melanogaster: the fly.Courtesy André Karwath aka Aka via Wikipedia Creative CommonsFlyMAD could be the best thing since sliced bread. The thermo- and opto- genetic device, created by team of scientists from the Research Institute of Molecular Pathology (IMP) at Vienna University and a US lab, allows the researchers to focus visible light and heat rays onto specific regions in a fly's anatomy and manipulate the annoying insect's behavior. 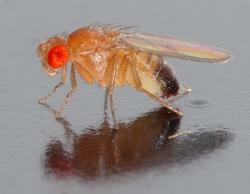 Using lasers and computers, the tool can precisely target and activate certain neurons in the thorax and brain of the fruit fly Drosophila melanogaster raising its temperature and stirring up its courtship behaviors. In one test, the fly began "singing" (through rapid wing vibration) as it hit on various balls of wax. Another test turned the pesky bug into the King of Plop causing it to switch into courtship dance mode (they had one doing the moonwalk!) What's wild is that FlyMAD performed these manipulations while the erratic test subjects were on the move inside an enclosed box. The science team, led by biologist Andrew Straw and his lab, documented the test results with video recordings, and published their findings in the journal Nature Methods. The name FlyMAD, by the way, stands for "Fly Mind Altering Device". Can you think of a cooler name than that? Maybe this could lead to the building of a better fly-swatter.